In the north of Spain, tapas are known as pinchos (or "pintxos") and are usually served atop a small piece of bread. As delicious as these appetizers may be, this tradition assuredly sounds like a Celiac's worst nightmare. Upon traveling to Logroño, La Rioja - the capital city of Spain's wine country - all I heard was talk of the famous pinchos on Calle Laurel. This notorious street in Logroño is lined with colorful tapas bars, each serving traditional Spanish pinchos to the wine-fueled masses. Instead of getting excited about this supposed foodie heaven, I felt an impending sense of doom. How would I survive in this perilous haven of bread? "Sin Gluten" means "gluten free" in Spanish. Hallelujah! Much to my surprise, many of Calle Laurel's eateries plaster these cheery cerulean stickers across their windows and outdoor menus. 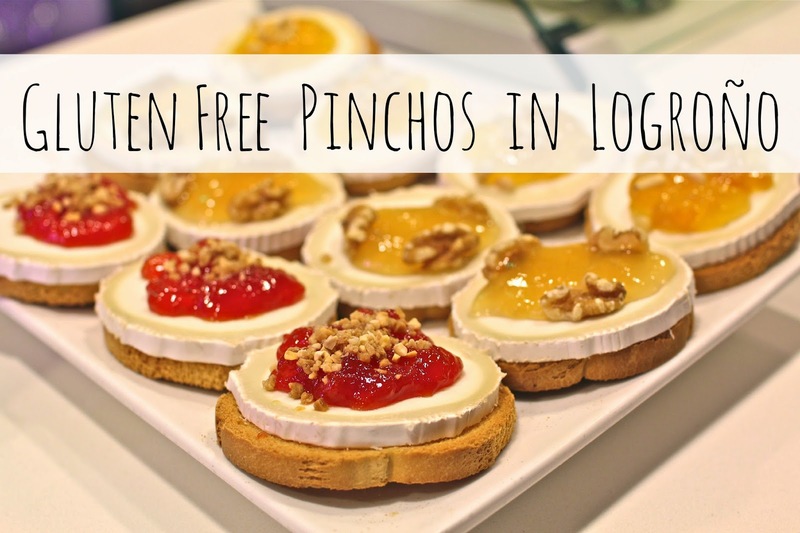 Each bar that displays it usually has a handful of gluten-free pinchos available to order. I flitted from bar to bar in awe, hardly containing my excitement and disbelief (...and hunger). The Verdict: So delicious I had to ask, "Are you sure this is gluten-free?!" The Verdict: Fried and marinated to perfection, these crispy potatoes drizzled with "spicy" tomato sauce and aioli did not disappoint. Of the many servings of patatas bravas I've enjoyed this past year, this batch inched its way up to the top of my list. The Verdict: The gluten-free bread had a nice consistency and an authentic flavor. My taste buds delighted in the simple combination of salty cured ham and rich, creamy cheese. I wish I had gone to Pata Negra more than just once! These next two restaurants aren't technically located on Logroño's famous Calle Laurel, but they're just a stone's throw away and still worth a mention. The Verdict: The gluten-free bread was too chewy for my taste, and the tapa itself was a bit plain. Although, I could have just been bitter that the bartender told me I couldn't order a gluten-free version of their signature goat cheese, jamón and raspberry jam pincho. Bummer. The Verdict: I kid you not, this was one of the best tortillas I've had in my life. (For now I'm going to put it in the Top Five, but that's subject to change!) Comprised of just eggs, potatoes and olive oil, this simple dish is the epitome of comfort food. This pincho de tortilla had just the right consistency and flavor. Because some of the bars get so crowded, many eateries have created "take out" windows for their pinchos. I obviously couldn't pass up a late night pincho de tortilla to-go! - If you're ordering something that doesn't specifically come with gluten-free bread, then ask for your dish "sin pan" (without bread). This is what I always had to do when ordering a slice of tortilla. - If you're nervous because your Spanish is rusty, then print out a gluten-free restaurant card like this one to show to your waiters. However, most servers are in a rush, so if you just ask for a tapa "Sin Gluten" or say "Soy Celiaca", the restaurant will know how to take care of you. - Follow the little blue "Sin Gluten" signs. They won't disappoint! Not gluten-free but still want to experience all that Calle Laurel has to offer? 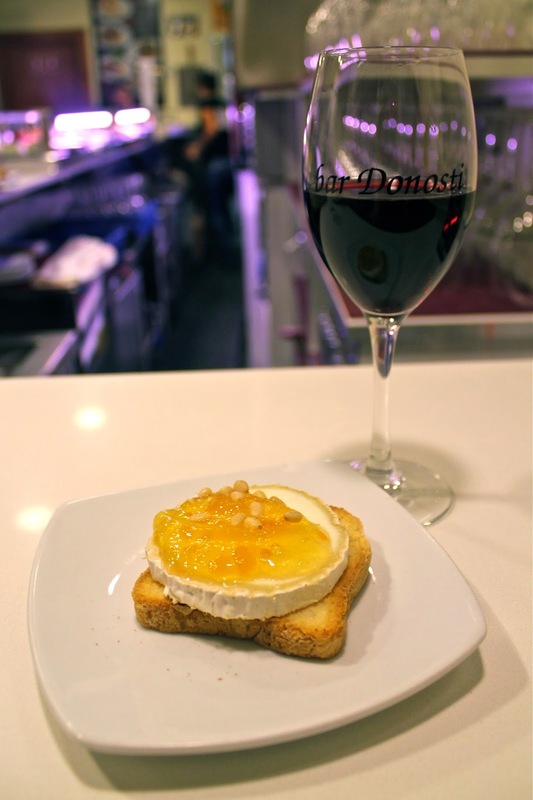 Check out Lauren's post on Pincho Hopping in Logroño! 26 comments on "Gluten-Free Pinchos Crawling on Logroño's Calle Laurel"
Love your food photos ;) Those patatas bravas look delicious (I thought they were dessert at first though). Glad you found a gluten free place! I don't really have food allergies, but China made me ever so slightly lactose intolerant - not enough to actually change my lifestyle since I'm not that into dairy anyway, but it's still annoying at times. Curse you, China. It was definitely exciting (and surprising!) to find so many GF options! I bet avoiding meat must be really tough when you're traveling. That reminds me of that one scene from "My Big Fat Greek Wedding" when the lady is like "You don't eat meat? That's okay, I make lamb". At least that's pretty much the attitude towards vegetarians here in Spain! I have a problem, hahaha. The things we do for blogging ;) I'm lactose intolerant too, but I always take a plethora of dairy pills since I refuse to live without cheese, lattés and gelato. I'd probably feel a lot better if I avoided it completely though! Wow—I had no idea that Logroño was so aware of people with celiac. Love this post with such a unique *and* practical angle. Can’t wait to visit La Rioja in December hopefully! I live in Logroño but had never really noticed the "Sin Gluten" signs before. Thank you for sharing this because I have a friend from the states visiting who has Celiac disease. oh, hello. this post is just a list of things I'm craving RIGHT NOW, so thank you for that ;) soo good! Oh my god, my mouth is watering for that goat cheese, peach marmalade, pine nuts combo. I will definitely be referring back to this post when I finally make it to La Rioja... great info! nom nom nom. Those patatas bravas look so perfect in that photo! Cute one of the two of you too! AMAZING!!! I am absolutely saving this post and quite possibly planning a vacation around it! Who knew that there was so much gluten free awareness in Spain? Those photos have me hungry already! Oh man it all looks soooooo good! And also, you are such a knockout! I know, my stomach growls every time I look at them haha. I want that goat cheese tosta right meow!! Thanks Trevor! I was honestly shocked by how accommodating Logroño was, especially since it's not even that big of a town. Hopefully San Sebastian will also have some Celiac-friendly pintxos available when I go in the spring! It was undoubtedly the perfect combo. The tomato jam one was even better, believe it or not!! Do you have plans to come back to España anytime soon? Gracias guapa! The patatas bravas tasted perfect too :) Let's go hunt some down in Madrid sometime soon - I could seriously go for some comfort food right now! Thanks Angie! I'm always caught off guard by how GF-friendly Spain is... I would have never expected it, but I certainly can't complain!! If you love food and wine, a trip to La Rioja is an excellent idea :) It's easily one of my favorite trips within Spain! I've had the non-GF ones there, and they're delicious! Possibly September 2015. But i'm trying the whole thing of a career with a salary and benefits. Something new to me! We'll see how long before I crack and I'm living abroad again! But really, there are positive aspects to both ways of life!